Shop Simply Dresses for a large and unique selection of graduation dresses, semi-formal white cocktail dresses and casual dresses for graduation. There are grad dresses in styles varying from sweetly adorable to sleek and strapless. Explore the one-shoulder graduation dresses and short white cocktail dresses for the parties that are sure to follow. You’ll find white dresses for graduation, baby-doll-style grad dresses, fitted short cocktail dresses with asymmetrical hemlines, and even beaded long graduation gowns that are sure to impress. If you are looking for high-school graduation dresses, short college graduation dresses, or even a long graduation gown for your special night, you're sure to find a grad dress from Simply Dresses that will brighten any venue. Why Do You Wear White for Graduation? Traditionally, wearing white stands for purity, birth, cleanliness, and freshness. Wearing a white dress for graduation ceremonies signifies a clean, fresh start or the birth of the new life ahead of you. Now, an additional benefit to wearing white dresses for graduation ensures that the color of your dress won’t clash with your graduation robe. When graduation day finally arrives and you don your beautiful white graduation dress, you will be recognized for all of your hard work! Why not celebrate your accomplishment in style? Simply Dresses has a large selection of graduation dresses, as well as chic white cocktail dresses for living it up at your after-graduation party. Look fashionable in a fit-and-flare grad dress, a trendy two-piece graduation party dress, a uniquely-textured short cut-out grad dress, or a fun-floral print dress for family celebrations after the ceremony. Looking for bling on your graduation dress? After the graduation gown comes off, you will dazzle your family and friends in an exquisitely beaded high-neck dress or a glittery white sequin dress for graduation. Your graduation day has finally arrived. Now it is time for you to be recognized for all that hard work, and of course you want to look great! You will find that Simply Dresses has wide selection of graduation dresses, and chic-cocktail dresses for your after graduation party. Look fashionable in a fit and flare grad dress, a trendy two-piece graduation party dress, a uniquely-textured short cut-out dress, or a fun-floral print dress for your after graduation party. Want a little bling? You will dazzle your family and friends in an exquisitely beaded high-neck dress or a glittery white-sequin dress. You may have a tough time choosing just one grad dress from this selection of high-school graduation dresses and college graduation dresses. So, why limit yourself just to one white dress for graduation? Many of these beautiful grad dresses are priced at just under $100, and some are incredible bargains at just under $50. 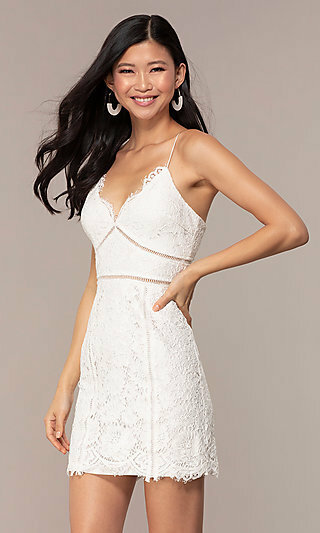 With these prices, you can get one white graduation dress for the ceremony, and one floral-print or white cocktail dress for the parties that follow! Whether you are looking for a short graduation dress, a semi-formal grad dress, or a short casual dress for graduation parties, shop this selection of graduation dresses to find styles that will flatter your figure without emptying your bank account. Stand proudly at your graduation ceremony in a graduation dress by Simply Dresses!